I want to thank you for an excellent trip. The arrangements were perfect in every way. 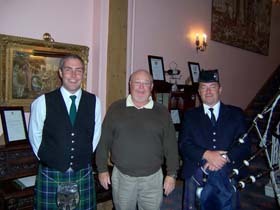 I have forwarded two pictures , the one is myself and the bag pipers at Culloden House in Inverness. The people were top notch. You went way beyond the call of duty with the service.